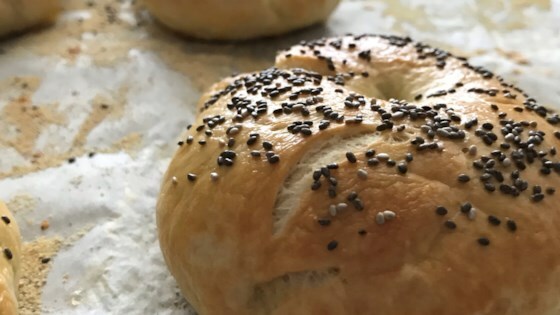 "Quick and easy bagels you can make with your bread machine! You can use whatever topping that you wish, many like poppy seeds." When cycle is complete, let dough rest on a lightly floured surface. Meanwhile, in a large pot bring 3 quarts of water to a boil. Stir in 3 tablespoons of sugar. Cut dough into 9 equal pieces, and roll each piece into a small ball. Flatten balls. Poke a hole in the middle of each with your thumb. Twirl the dough on your finger or thumb to enlarge the hole, and to even out the dough around the hole. Cover bagels with a clean cloth, and let rest for 10 minutes. Sprinkle an ungreased baking sheet with cornmeal. Carefully transfer bagels to boiling water. Boil for 1 minute, turning half way through. Drain briefly on clean towel. Arrange boiled bagels on baking sheet. Glaze tops with egg white, and sprinkle with your choice of toppings.